Welcome to our glossary of tornado terms. This section will help you understand the different words and phrases that might come up when talking about tornadoes. We compiled tornado terminology useful to the average student, teacher or tornado enthusiast. We encourage you to bookmark this page to make is handy. 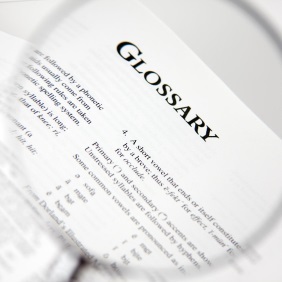 If you're a storm spotter you'll find the Glossary of Weather Terms for Storm Spotters by NOAA to be a much better resource. Air Pressure - Also known as barometric pressure, is the weight of a column of air that extends from the surface (ground or water) to the top of the atmosphere. A tornado has very low air pressure. Anemometer - This is a weather instrument used to measure wind speeds. Barometer - This is a weather device used to measure air (barometric) pressure. Barometric pressure - Also known as air pressure, is the weight of a column of air that extends from the surface (ground or water) to the top of the atmosphere. A tornado has very low barometric pressure. Doppler on Wheels (DOW) - A fleet of X-band weather radar trucks. Energy Scale - Also known as the E Scale, this is another tornado scale developed by Nikolai Dotzek. Enhanced Fujita Scale - An enhanced version of the Fujita-Pearson tornado scale that went into use in the United States starting in 2007. Like the original Fujita scale it has 6 different ratings, EF0 to EF5. It also has addition damage indicators to help measure the intensity of a tornado. Forecast - This is a prediction made by meteorologists of what the weather will be like in the future. Fujita Scale - Also known as the Fujita-Pearson Scale, is a tornado scale used to rate the intensity and damage level of a tornado, with a rating between F0 to F5. As of 2007, the United States has used the Enhanced Fujita Scale instead of the original Fujita Scale. Funnel Cloud - A rotating column of wind that hasn't touched the ground. Funnel clouds are called tornadoes when they reach the ground. Hail - Frozen precipitation (ice) that forms in mid-latitude thunderstorms. Jet Stream - A powerful, but narrow stream of wind that is in the upper troposphere. Landspout - The term for a weak tornado that looks similar to a waterspout. Latitude - The angular distance north or south from the equator to a particular location. The Equator has a latitude of zero degrees. The North Pole has a latitude of 90 degrees north; the South Pole has a latitude of 90 degrees south. Longitude - The angular distance east or west from the north-south line that passes through Greenwich, England, to a particular location. Greenwich, England, has a longitude of zero degrees. The farther east or west of Greenwich you are, the greater your longitude. The Midway Islands (in the Pacific Ocean) have a longitude of 180 degrees (they are on the opposite side of the globe from Greenwich). Meteorologist - A scientist who studies the weather (meteorology). Meteorology - The science that deals with weather. Multi-Vortex Tornado - This is a tornado that has two or more sub vortices that circle the center of a larger tornado. NOAA - National Oceanic and Atmospheric Administration, which is a United States government organization that tracks and studies storms. They also issue advisories for storms. Overcast - This is the term used to describe a sky that is covered with clouds. Radar - Short for Radio Detecting and Ranging, is used to detect objects at a distance. Rope Tornado - This is a tornado that is roped shaped, with the similar appearance of a snake. This is generally what a tornado will look like towards the end of its lifecycle. Significant Tornado - Any tornado that reaches F2/EF2 damage intensity is considered a significant tornado. Supercell - A dangerous type of thunderstorm that has a rotating updraft. These type of thunderstorms can last for hours and produce large hail, flooding, lighting, strong winds and tornadoes. Thunderstorm - A storm that has thunder and lighting. They often contain strong winds, rain and potentially hail. Tornado - A violent, funnel-shaped rotating column of air that has contact with the earth's surface and is extended from a thunderstorm base. Tornado Alley - Tornado alley is a phrase used to describe an area in the United States where tornadoes frequently develop. Tornado outbreak - A tornado outbreak is the occurrence of multiple tornadoes spawned by the same synoptic scale weather system. Tornado Warning - A tornado warning is issued when an actual tornado funnel has been sighted or detected by weather radar. Tornado Watch - A tornado watch is issued why the weather conditions in a specific area/region are favorable for the development of a tornado. TORRO Scale - The scale from T0 to T10 used by the United Kingdom to classify tornadoes. Turtle - A device used to study tornadoes. Twister - The colloquial term for a tornado. Waterspout - A tornado that occurs over a body of water. Weather Map - A map that shows current and future weather conditions for specific areas. They generally show storms, fronts, temperatures, rain, snow, sleet, fog, etc. Weather Satellite - A device that orbits the Earth to analyze weather.